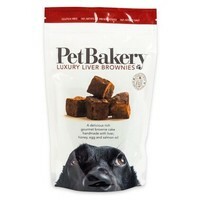 Pet Bakery Luxury Liver Brownies Dog Treats are delicious rich gourmet brownie cakes handmade with liver, honey, egg and salmon oil. Made with only top-quality ingredients that contain no preservatives or added salt, let your doggie feel the love with the Pet Bakery Luxury Brownies. The artisan doggie delight will ensure you have a happy dog. One of our dogs really love these cakes it is the first thing he eats at his breakfast from his bowl. Other two dogs like it too but not so much as Rexik their brother.